As we approach the Thanksgiving holiday, we thought it appropriate to do some reflecting. It has been a really big year for us and we have a lot to be thankful for! We’re so thankful for our founding group of dedicated team members who have gone the distance with us - we could not have made it this far without them. We are also excited to welcome so many new additions to our team this year! We’re grateful to have new talent, energy, and ideas - all contributing to the future of J2 Innovations. We are so grateful to our OEMs and Authorized Distributors who makeup our solid FIN Community. It’s exciting to see how our OEMs are leveraging FIN and creating amazing new applications in many new markets. We’re thankful for our FIN distributors, who have championed FIN Stack and have facilitated tons of successful projects. The Project Haystack community continues to grow and contribute to this effort to create a standard that will elevate our industry. There is a growing ecosystem of technology providers who add value to the FIN framework and we are so thankful for all of them. AND we are very excited about Haystack Connect 2019! Finally, we are extremely grateful for Siemens - who decided to invest in us this year. We are adding new team members and driving towards our vision to continue building our OEM business and grow into a global technology company. Thanks to Siemens, we have additional capital and a renewed focus that will enable us to enhance FIN technology and expand into new markets. We are so excited to take J2 and the FIN Framework to the next level! 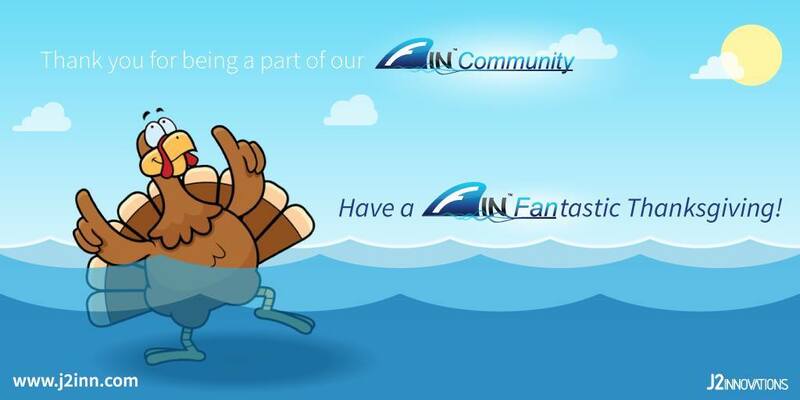 We hope you have a FINtastic Thanksgiving!